Children build on their strengths, and to do that building—to grow academically and socially—they need us to recognize and encourage their positive efforts. But what’s the best way to offer that recognition and encouragement? For some time, I used rewards—tickets that I gave out when students met expectations. But something felt wrong: Although students would often change their behavior, at least temporarily, they seemed more focused on the tickets than on learning and building a classroom community. When I taught expectations and then used words in this way, students knew I believed they wanted to and could learn. The difference in their learning—and their behavior, motivation, independence, and stamina—was amazing. Still, it took me a while to complete the transition from rewards to words. Here’s my story. My ticket system was a way to reward students when they chose positive behaviors. Sometimes, when the entire class walked safely and respectfully in the hallway, I’d put a ticket in a jar. Other times, I would notice individual students completing work efficiently or working cooperatively and give them a ticket to place in the jar. Once the tickets in the jar reached a number I’d pre-designated, the whole class earned a prize, such as extra recess. The system seemed to be working alright. But then I noticed that as students became more proficient in routines, procedures, and skills, they were still expecting tickets. A typical scenario: One day when the class was walking safely and calmly in the hall, a colleague passed by and commented how quiet the children were. When we reached our destination, Luna asked me if I was going to put a ticket in the jar because not only were they quiet in the hallway, but another teacher had noticed. This sort of thing happened frequently, with children asking if they would receive a ticket for meeting expectations such as sharing materials, picking up trash, and completing tasks on time. Students had become more focused on receiving tickets—on being rewarded for their actions—than on understanding how and why to choose actions that would help them learn, stay safe, and respect others. They weren’t developing their motivation or their learning muscles. That’s when I realized that although the ticket system did seem to work in the short run, in the long run it was working against my ultimate goal—developing intrinsically motivated students. I needed to reconsider how to recognize positive behavior. I’d heard about reinforcing language and decided to look into it. At first, ending my reward system seemed like a daunting task, and I had many questions and concerns. Could students really be kind to each other or complete their classwork without receiving tickets? Could I manage the classroom and nurture positive behavior without a quick, convenient system that required me to think and say very little? How could I teach efficiently while also carefully choosing words that would help students develop into strong, independent members of our learning community? But then I remembered my own learning experiences, the ones that had the greatest impact on me. What made certain teachers of mine so powerfully motivating? One characteristic that stood out was the specific feedback they gave to let me know exactly what I was doing well. 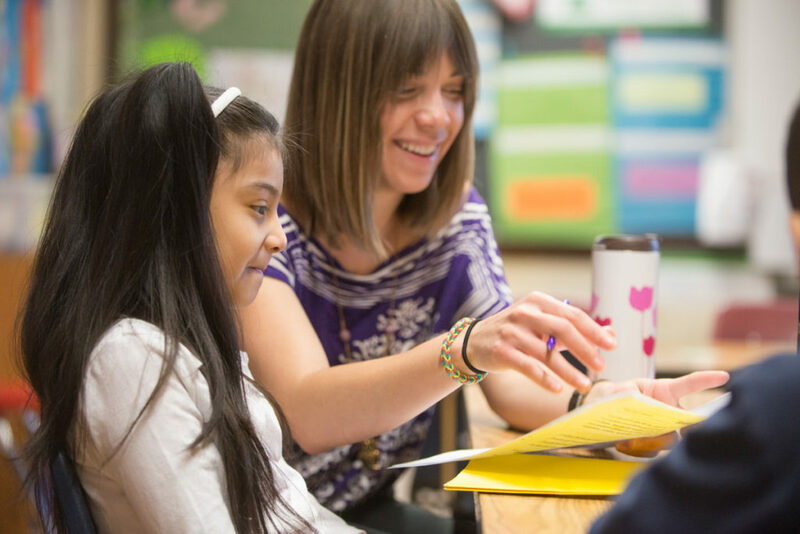 Because my teachers’ reinforcing language had helped me develop my academic skills—and become a responsible community member—I was confident that using reinforcing language with my own students would have a similar impact. And I decided that if I allowed myself to learn this language slowly and steadily, I could eventually master it. I began this learning at a Responsive Classroom summer workshop. We studied the characteristics of reinforcing language—clear and direct, genuine and respectful, and specific—and practiced using it. Afterward, I read The Power of Our Words: Teacher Language That Helps Children Learn. I then felt much more prepared to replace my ticket system when school started that fall. Posted this quote from Responsive Classroom on my computer screen: “Children, like all of us, need to feel recognized for their positive contributions and accomplishments. And they need ongoing information from the teacher about how they’re doing.” Each time I saw this quote (many times a day), it reminded me that students needed me to support their learning and positive behavior with reinforcing language. Created multiple cue cards—sheets of construction paper on which I wrote reinforcing language sentence starters for myself, such as “I see you followed our rule on _____” and “You did _____. That helps us all be better learners.” I hung these cards so that I could see one from anywhere in the classroom. Made sure to use reinforcing language with every child. Even when a student’s behavior or work isn’t where we want it to be, we can see positive efforts and growth if we observe carefully. To keep track of whom I’ve used reinforcing language with, I checked names off a list, keeping the list private to avoid provoking competition or anxiety among students. I’d say . . .
your math! You tried several different ways to solve that problem. That kind of persistence really helps you learn! I love how you worked in the library. You used your very quiet voices in the library. That helped the other students keep their learning going. You’re doing better with your writing. I see that you included vivid adjectives. That helps readers really “see” what you’re describing. Gradually, reinforcing language has become my main tool for recognizing and encouraging students’ positive behaviors. But that doesn’t mean never using rewards. Some students with an entrenched negative behavior, such as habitually calling out during group discussions or speaking sarcastically to classmates, need that extrinsic support for a short time while I help them recognize and grow their capabilities and build their intrinsic motivation. Before moving right to an external reward, though, I first try a tangible tracking system. A small chart taped unobtrusively on a child’s desk enables us to check off how many times she remembers to raise her hand before speaking, use kind words, or walk quietly in the hall. Having a tangible tracking system to prompt self-noticing—and to show that I am also noticing—is often enough to motivate children to engage in positive behavior. That first year I used reinforcing language, students misbehaved less frequently, so I was less stressed and more able to interact positively with the class. And with their attention drawn to specific things they could do to meet expectations, students learned more, both academically and socially. Reinforcing language was a win-win for all of us. Tracy Mercier taught grades three, four, and five for twelve years in diverse classrooms.